I want to tell you about Marietta my neighbour, she’s twice my age, I’m 44. We met ten years ago when I discovered her in my garden picking grape vine leaves to make dolmades. She told me her name was Maria but her real name is Marietta, which I always use. I said my name’s James but she’s called me Davi ever since! 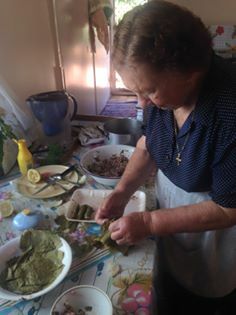 She came back later and gave me a bowl of her delicious homemade dolmades and that mutual giving between the two of us has continued for 10 years. Marietta came to Australia as a 19 year old from Greece, post WW2 after it had been occupied by the Italians. She’d learnt Italian during the war. She arrived in Australia, married had a daughter and then was widowed when her daughter was young. Marietta found herself work while her daughter was cared for by another woman because there was no child care around at the time. Marietta learnt to speak English but never learnt to read or write it. There were no free classes she could go to. She had no time as she worked hard to survive. Marietta got married a second time and had a son and now has great-grandchildren too. Her family visit most weekends and during the week Marietta can be seen tending her beautiful garden with roses, hippeastrums, lilies but also beans, okra and spinach to name a few. We call out good morning across the road, often at 5.30am as we’re both early risers, watering our gardens or when I’m going to do some sport. But the most important thing about our relationship is that is about giving to, supporting and loving your neighbour. I give her pawpaw and she returns with beans, I give her bananas, she gives me pasta for dinner for my family, I give her eggs from my chickens and she gives me biscuits for my coffee, I jump start her car and call the RACQ for her, she keeps an eye on my kids and home when I’m away. I read letters for her. Marietta tells people I’m like a son and I tell people about how amazing she is. Of course I said, “No, it’s not about money it’s about helping each other and working together and loving your neighbour”. I went away with a plate of Marietta’s biscuits to dip in my coffee. The truth is that I do want money and help. I am just just one hand that wants another hand to wash a face. I know that if Marietta had had the opportunity she would have loved to learn to read and write English but like so many people who live in Australia the opportunity wasn’t there. That’s why I have started, James’ Blue House Free School, to take technological literacy to people and so people can find information that allows them to shape their destiny. Marietta doesn’t know what the internet is, she doesn’t have email, and facebook is outside her comprehension. That’s why I am asking for volunteer teachers for local English classes. That’s also why I am asking for money so that I can buy and equip a double decker bus with learning technology to take the concept of free school to remote areas where people don’t have easy access to education. I just went to the first Blue House, the place where I met Marietta, to feed the chickens, collect some eggs. While I was there. 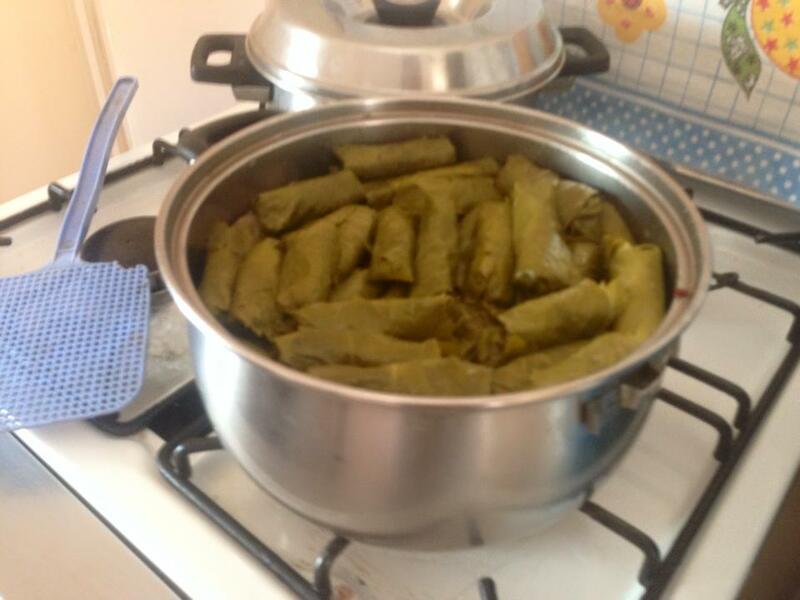 I picked some grape vine leaves and took the eggs and leaves over to Marietta, She was making dolmades and showed me how and told me the recipe. She teaches me, I love her. PS Please share this post.